Four Disc Grinder Rental – EDCO 4GC-11H, is available for rent in Rochester NY, Ithaca NY and the entire Western New York region from the Duke Company. 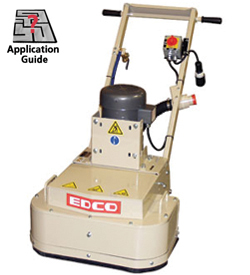 This EDCO machine is gasoline powered, 11 horsepower, four disc floor grinder with 36 inch working width and 13 horsepower engine. Capable of grinding approximately 800-1,000 square feet per hour at 1 / 32 of an inch. The machines technology includes counter rotating discs wich help prevent he the grinder from moving side-to-side – resulting in greater operator control.